Lean Sigma Corporation is not only a leading of provider of Six Sigma licensing for classroom, online and eLearning training content, but also a management consulting firm with years of experience leading and managing operational excellence programs. With this experience, we have developed a hosted operational excellence solution designed for the needs of any corporate deployment. DeployOpEx. is a complete system that includes training content, project and program management, dashboards, document sharing and management and a centralized calendar. Get your program off the ground instantly with our complete operational excellence system. It will be fully customized for your company and entirely "white label". Our online platform will centralize all of your program elements allowing your teams to focus on value and execution, not infrastructure and administration. Branded for Your Company and hosted by Lean Sigma Corporation. 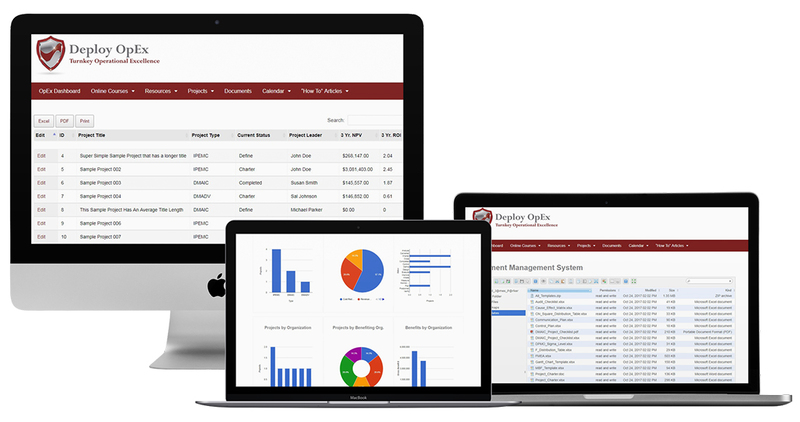 Deploy OpEx is a customized online solution for operational excellence programs or Six Sigma project management needs. We have combined our globally recognized and accredited training content with our operational excellence deployment experience to create the best solution for coordinating and managing a successful operational excellence program. Whether you're starting a new "OpEx" program or need to organize the one you have, we can provide you with a fully branded and hosted online system. It will be your central source for everything related to your deployment. 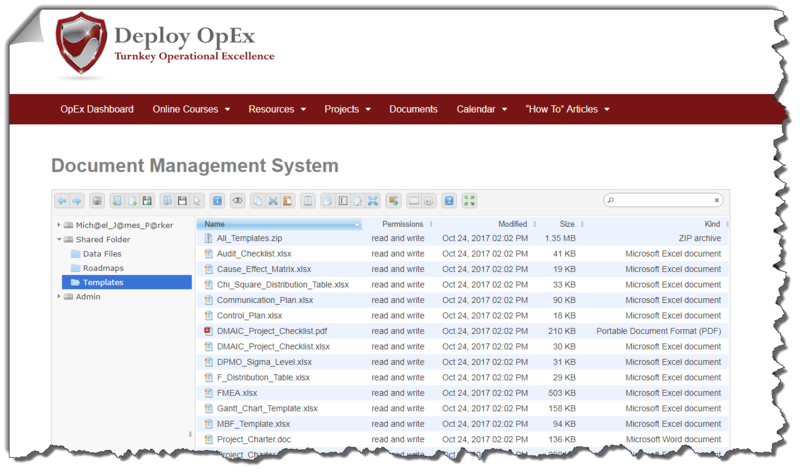 From program calendar to project database to online resources for your students, instructors and project leaders, Deploy OpEx will enable coordination, visibility, accountability and most importantly "Operational Excellence". Our world class training content branded for your company! Customizable Powerpoint files making up the entire Lean Six Sigma Black Belt, Green Belt and Yellow Belt curriculum as well as our Design for Six Sigma and Lean Bronze curriculum. Also included will be our entire suite of tools, templates, roadmaps, data files and test files. All professionally designed and edited, these training materials will be pre-branded for you and provide you with instant content to initiate your training program. 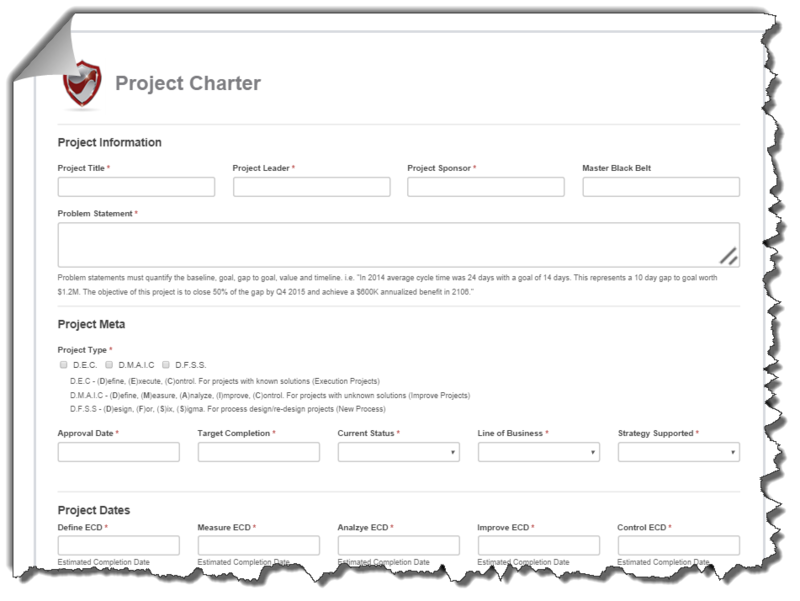 Add projects to your online project database with the project charter form (below) includes all the necessary fields to track project status, tollgate dates, dollars, project types, project leads and much more. At request, the forms can be customized to your organizations specific needs. 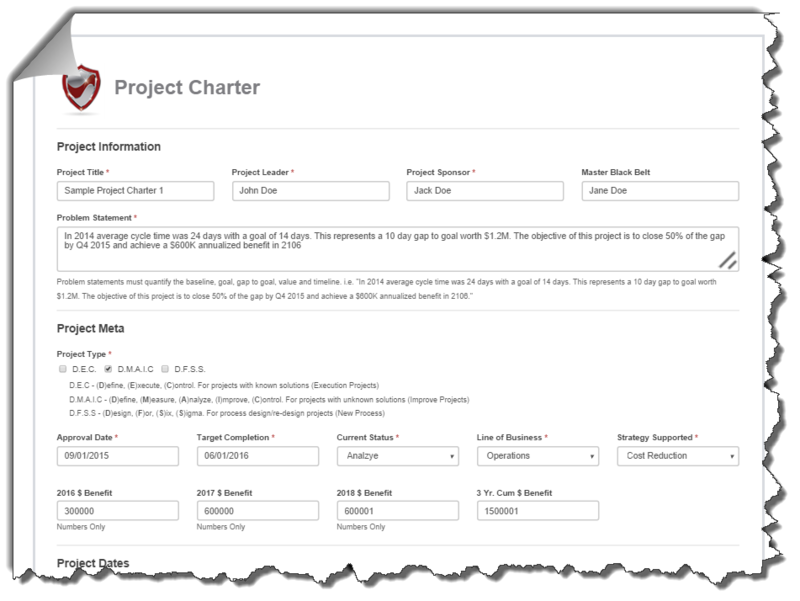 Any project entered through the project charter form (above) will be listed on the projects page (below). Users, managers and coordinators can be granted rights to edit, update, delete and even export any element of the project information. Exports of project data can be downloaded to Excel to allow your organization to report on dates, dollars, completion times, dollars by project lead, sponsor, organization etc. From the project list page (above) users can click "edit" and will be taken to the populated charter (below) where any field can be updated. 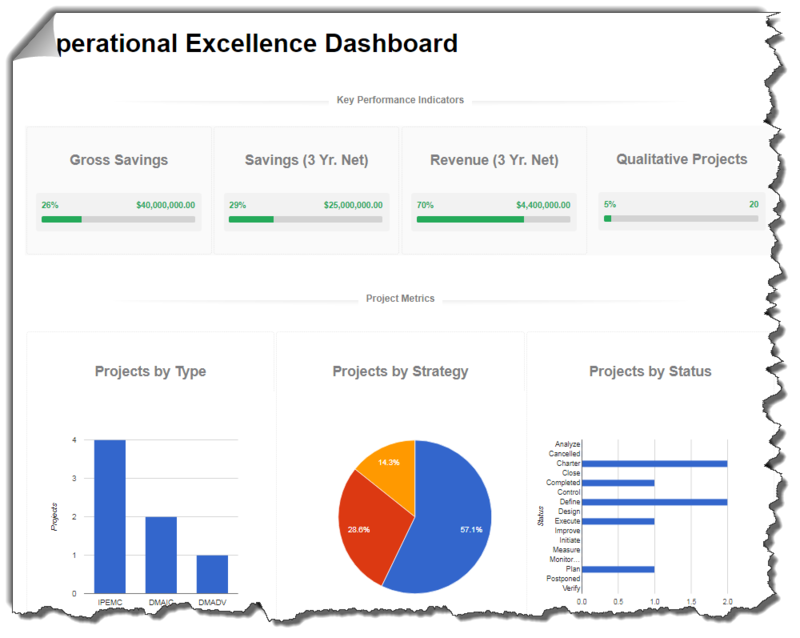 Your operational excellence dashboard is linked to your project data base so that any project updates will be reflected in your dashboard. We can customize the dashboard to display graphical or tabled metrics of any aspect of data collected for your projects. A centralized document storage and management repository where you can share documents with everyone who has system access or you can keep your files private in your own personal directory. Includes an administrative directory for program administrators to share files between admins, managers, executives or anyone else you designate to have access permission. Awareness leads to engagement. Don't leave any reason for miss-communication. Display your events, training classes, project reviews, tollgates and anything else related to your operational excellence program. 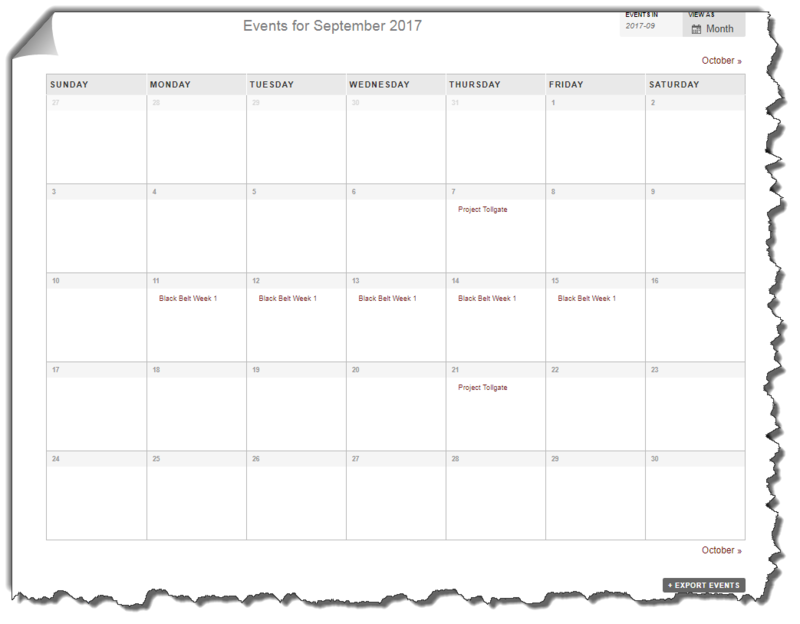 The centralized calendar will allow all users to see upcoming events. Users can even download events to their own outlook or google calendar so there will never be a reason program participants are not aware of your key program activities. Another invaluable feature is the Group and Private Chat function. 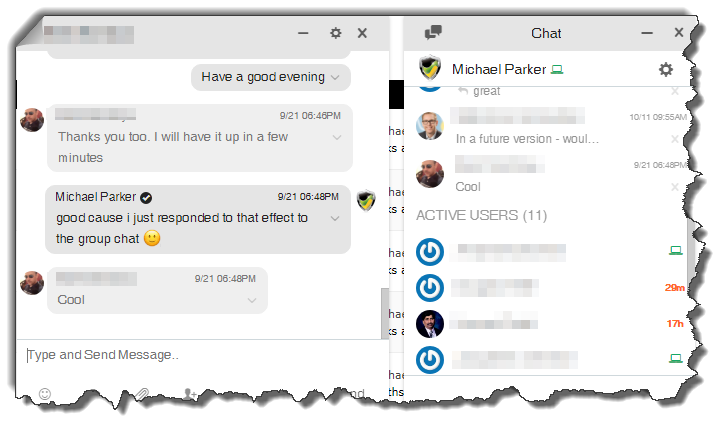 Users exchange chat in real time as a team in the group chat room or chat with one another by choosing specifically who they want to chat with.